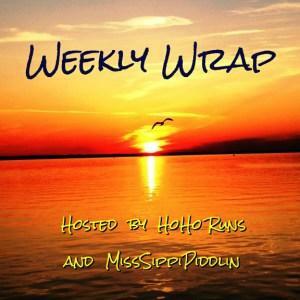 I didn’t get a chance to post this on Monday, due to some delayed travel, but I’m back in town, and that means it’s time for the Weekly Wrap with HoHo Runs and MissSippi Piddlin! This was our family day. We took Nana and Papa Bear out to brunch to celebrate Grandparents’ Day and then they came back to our house for the official opening of football season. Mr PugRunner did another run with the Big Green Egg and made pretty delicious burgers for us to enjoy with all the games. I had a beautiful sunrise run. Once again, I slowed way down and skipped my intervals altogether. It felt really great to know that I could run five miles without stopping, and I was pretty proud of myself. I’m not sure what I’m going to DO with that knowledge (continue from this point, return to intervals, etc), but at least I know I have the capability. I followed the run with a nice Body Circuit session. Some of the moves were pretty tricky on tired legs, but I powered through, anyway. I was up bright and early for a work meeting, and felt like I spent the rest of the day in the car. It made the day pass pretty quickly, so I didn’t mind too much. After I got little man settled with his homework, I headed out to do a little babysitting so my friends could attend an informational session at our school. and then followed it up with a spin session. 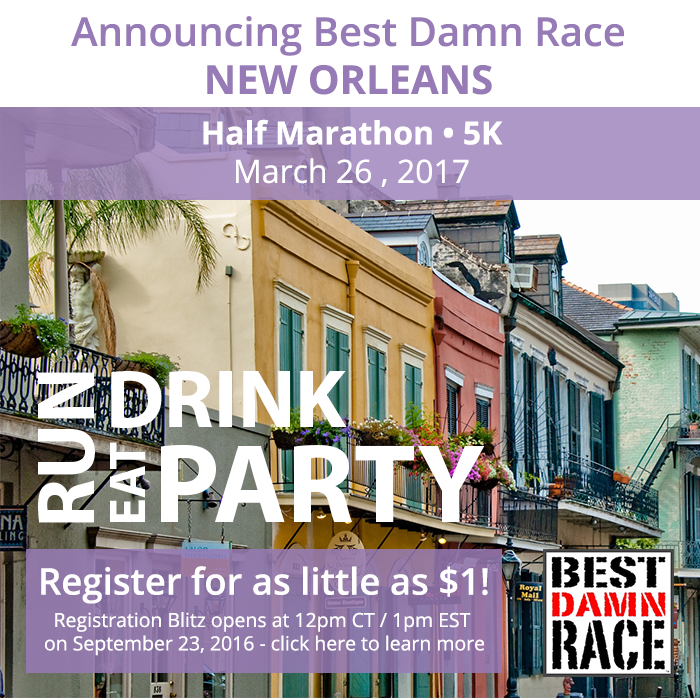 When I got home, there was a pretty cool announcement waiting for me: Best Damn Race would be coming to New Orleans in 2017! So cool! Be prepared for the Registration Blitz on Friday, September 23 – registrations for the Half and the 5K will start at $1! We also got a little bit of mail! Travel documents for our anniversary trip! I’m so excited! I thought about going to spin and possibly Body Recon, but I had a lot of errands to run and I knew we were going to be doing a lot of walking and sightseeing in Philadelphia this weekend, so I let it go. Instead, I picked up some more last minute items for the trip, met my parents for lunch, and got home in time to finish packing. That evening, my friend returned the babysitting favor so Mr PugRunner and I could go to little man’s Curriculum Night. While we know his teacher, it was a chance to hear from the whole third grade staff as to what the year is going to hold, and then visit the classroom to get a feel for how the students’ day to day academics are going. We were very pleased with everything we saw and heard, and we know it’s going to be a great year. I decided to go for one little shake out run before my flight so I wouldn’t have to bring extra shoes and gear to Philly with me. We dropped little man at school, grabbed a bagel for the road and then made our way to the airport. I found a great deal on a smaller airline from a less popular (but closer) airport, and figured we would give it a try. Everything went really smoothly and by 10:30, I was in Philadelphia! My friend, S, picked me up at the airport and we hit the town! I’ll share more details with my race recap this week. We got a good night’s sleep and then headed back out for more tourism! Again, we walked a ton. We also visited the Rock ‘n’ Roll Philadelphia Half Marathon Expo to pick up our packets and do a little shopping. We tried to make it an early night, but I think we were both pretty excited, and couldn’t wait for the race! It was a great week on all fronts. I love traveling, and it’s even better when I get to go somewhere new. The anticipation leading up to this past weekend was fantastic and I am so excited to share all about the race and the weekend with you! That said I am looking forward to a few days off and getting some rest! Do you enjoy traveling to new cities? *As a Rock ‘n’ Blogger, my entry to the Rock ‘n’ Roll Virtual Series/Make a Band and Global Tour Pass were complimentary. All opinions are my own. It was nice meeting you this weekend Jenn! Looking forward to reading your race recap! Glad to hear the running is going great! Five miles!! That’s a victory! I can’t wait for the recap! We’ve been on one Sandals trip (Jamaica). It was fantastic. They really know how to spoil you! I hope you had a great time in Philly. And congrats on the non-stop miles. That’s a huge milestone. Thanks for linking, Jenn!